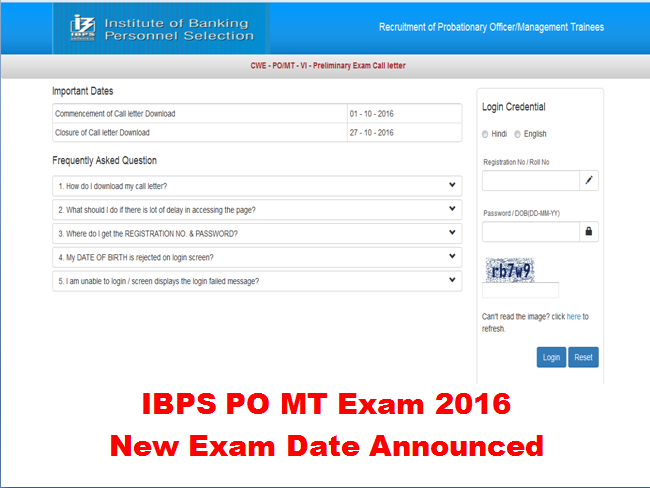 Institute of Banking Personnel Selection (IBPS) has announced the new exam date for IBPS PO 2016 Exam. The IBPS PO MT 2016 Exam 2016 is scheduled to be conducted on 27 October 2016. Institute of Banking Personnel Selection (IBPS) has announced the new exam date for IBPS PO 2016 Exam. The IBPS PO MT 2016 Exam 2016 is scheduled to be conducted on 27 October 2016. IBPS earlier notified the same exam to be conducted on 23 October 2016 however, as per the call letters which have arrived to the students; the mentioned exam date is 27 October 2016. IBPS issued the notification for recruitment of 8822 posts of Probationary Officer (PO) in Allahabad Bank, Andhra Bank, Bank of India, Canara Bank, Central Bank of India, IDBI Bank, Oriental Bank of Commerce, Punjab National Bank, Punjab & Sind Bank, Syndicate Bank, UCO Bank, Union Bank of India, United Bank of India and Vajaya Bank. The IBPS PO 2016 will go under three steps of recruitment procedure i.e., Preliminary Examination, Mains Examination and Interview. As per the updates, this year around 02 million candidates have applied for IBPS PO 2016. The candidates who will qualify in the Preliminary Examination will be required to appear in the Main Examination which is scheduled to be conducted on 20 November 2016. Therefore, candidates appearing in Preliminary Examination can expect their IBPS PO Prelims Result 2016 to be out in November 2016. The admit card for IBPS PO MT 2016 Prelims Exam is available on official website i.e., ibps.in. Candidates who have applied for the examination can download the admit card by filling in the relevant details like registration number/ roll number and date of birth.